Some time ago (12/4/2016)), I addressed misconceptions folks had about Pastoral Counseling. Today I’d like to give three examples of how Pastoral Counseling uses similarities between Biblical wisdom and modern psychology to help their clients. Old stories from childhood can sometimes help bridge the gap between the familiar concepts of faith and the strange and unaccustomed language of psychotherapy. Indeed there are profound similarities between a biblical and a psychological point of view in three important areas: Anxiety , Reality Testing and Detachment. Many suffer from the anxiety caused by an obsessive-compulsive disorder but the very terms used to describe this emotional problem can be off-putting and even scary. For those people of faith who are familiar with the Bible, however, the story of Mary and Martha (Mt. 10.38-42) not only provides an excellent description of what an anxiety /obsessive/compulsive disorder looks and feels like but it does it in a way that is non-threatening and understandable. Talking about Martha’s worry and crippling inability to simply be present and enjoy Jesus’s presence in her home, is a situation with which many can identify with and relate to. Likewise, Jesus’, addressing her and identifying her anxiety, literally, gives her permission and reassurance that she does not have to worry and that it is okay for her to relax and be with her guest as her sister Mary can. In addition to offering reassurance to Martha, the story also helps us to understand that underneath Martha’s rude or angry behavior is a painful anxiety. Many people have trouble making decisions and are plagued with self-doubt and confusion knowing what to believe, especially when they have strange or destructive impulses and thoughts. Indeed an important technique of cognitive therapy which has become a fundamental tool in psychotherapy is to be aware of our thoughts and to reality test-them before acting on them. Thousands of years ago, Paul provides some similar advice for in his first letter to the Thessalonians (5.19-21). At the time, many Christians were filled with the spirit (or at least believed that they were) and it was causing a practical problem for worship services. So many people wished to speak that worship could go on for four or five hours. Paul in striking a balance noted that people would neither despise prophesying nor quench the spirit but … he also added, that they should test everything. Again, for someone who comes from a religious background, the notion of testing the spirit is more graspable than the somewhat cold notion of reality-testing. The lesson is the same, however: Just because a person feels or thinks something strongly does not mean that it is truth or helpful. Carefully examining thoughts in the context of logic and known facts it a good way to sort out that which can be trusted. Finally, many families are plagued with the problems of addiction and co-dependency and while the notion of detachment is recommended to protect family member from the abuse of those who refuse treatment, many Christians feel guilty or that detaching is cruel or worry what will happen to their loved one if they don’t enable their addiction and go along with their manipulations. Some believe that their faith requires them to accept and endure outrageous behavior. In sharp contrast to this belief, the story of the Prodigal Son ( Luke 5.11-32) provides an excellent example of a loving father who nonetheless is able to completely detach from his renegade son. It also models how a parent can love and welcome their child back after s/he had come into his mind and returns having really changed and asked for forgiveness. 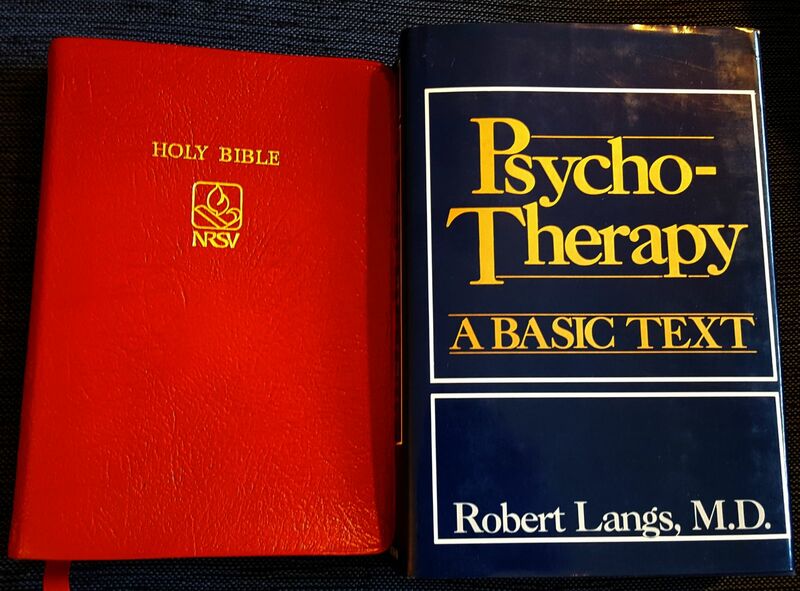 These are but a few examples of how old and familiar Bible stories can help those of faith approach and understand psychological problems and psycho-therapeutic concepts. Most of all it is important to understand that the life of faith is not in competition or conflict with science and psychotherapy but that the two can work together and mutually enhance our understanding of life and our world.